Taktsang Palphug Monastery more famous as Paro Taktsang is a Buddhist temple complex which clings to a cliff, 3120 meters above the sea level on the side of the upper Paro valley, Bhutan. Mountainous Paro valley is the heart of Bhutan; here the only international airport of the country is located. The Taktsang Palphug Monastery is one of the most famous touristic destinations of the country and the cultural icon of Bhutan. Visiting the Paro Taktsang Monastery is an unforgettable experience thanks to its unique location and the views of surrounding majestic mountains and emerald green valleys. The main peculiarity of the monastery is its isolated location. It is only accessible by mountainous paths. The remote location of the monastery makes it amazingly beautiful and unique, but also creates technical difficulties. When on April 19, 1998 a fire started in the Monastery it was burned down completely: the temple was hard to access and the emergency assistance was impossible. 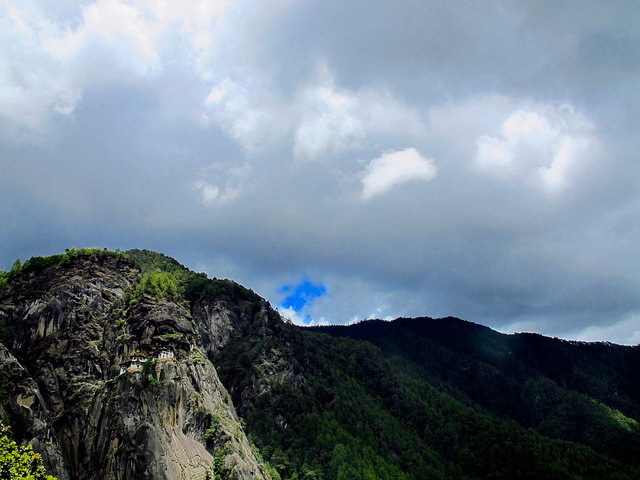 No wonder, that when you are looking at the Taktsang Palphug monastery from Paro valley or from the bottom of the cliff, it seems almost impossible to reach the Monastery. In fact, there are three paths leading to the holy place. The first path is a trail passing through the pine forest and decorated with bright, prayer bannerettes symbolizing protection from evil forces, positive energy, vitality and good luck. The other two paths are passing through the plateau, called "a hundred thousand fairies’ plateau." The refined architectural appearance of the Monastery is shaped in the best traditions of Buddhist. The complex has white buildings with golden roofs. 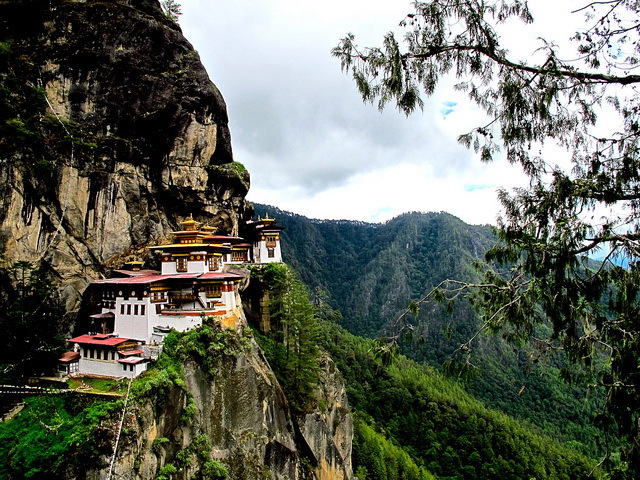 Paro Taktsang Monastery consists of the 4 main temples and several dwellings. All buildings are interconnected by staircases with steps carved into the rock. Almost every single buildings of the monastery complex has a balcony with a breathtaking view of the surrounding area. The main shrine of the monastery -the prayer wheel is located in the courtyard of the temple. Every morning at 4 a.m. it is being rotated by monks to mark the beginning of a new day. The interior design of the temple impresses with its luxurious beauty: gold-plated dome and flickering lights that are illuminating golden idols. In the hall of Thousand Buddhas, which is carved into the rock, a large statue of a tiger is located. The tiger is respected as the symbol of Paro Taktsang because of the legend, according to which the location of the Monastery was chosen by a tigress. The tigress brought here on her back the founder of Bhutan’s Buddhism guru Padmasmabhava. There are eight caves in the monastery; four of them are comparatively easy to access. The cave where Padmasmabhava is believed to have entered first, on the back of the tiger, is known as “Tholu Phuk” cave and the one where he meditates is known as the “Pel Phuk”. Monks of the monastery are supposed to live and meditate in these caves for 3 years. They rarely visit the adjacent Paro valley.